Savings with Energy Efficiency Programs & Incentives For Energy Efficiency Are Energy Efficient Appliances Worth It? Energy Efficiency or Solar First? Home Energy Audits Energy Efficiency Companies Are Energy Efficient Homes Worth It? With today’s emphasis on environmental consciousness, energy efficient homes are fetching higher prices on the housing market, and for good reason. Green homes are priced at a premium because their energy efficient upgrades offer both reduced utility bills and avoided maintenance expenses. This premium also reflects the improved quality of life that green upgrades can offer homeowners, including both health benefits and enhanced in-home comfort. Consequently, residential energy efficiency is an investment that yields financial benefits in the form of both immediate month-to-month savings and future profits when the house is sold. Consider the example of upgraded attic insulation. 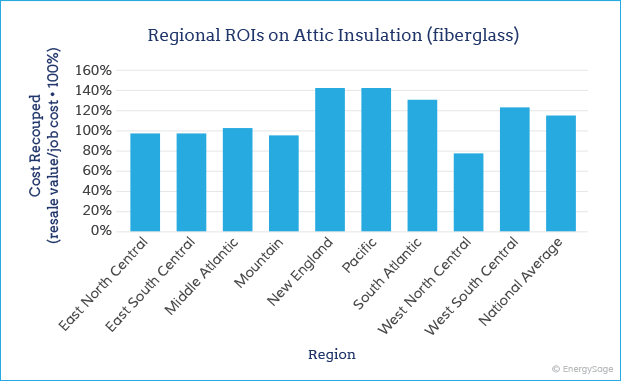 According to Remodeling Magazine’s 2016 Cost vs. Value Report, attic insulation renovation was the most profitable energy-efficiency upgrade for homeowners across the United States. During an attic insulation project, the attic floor is air-sealed to prevent conditioned air from escaping the home interior into the attic, and fiberglass loose-fill insulation is added until a certain level of insulation is met. On average, homeowners saw a 116.9% return on investment on their attic insulation renovation when they sold their home. A standard energy-efficient insulation project costs about $1,268, which means that updating your attic insulation translates into your home selling for $1,482 more on average. Understandably, the profitability of attic insulation upgrades depends on the climate where you live. These projects were found to be most profitable upon resale in New England, Pacific, and West South Central regions, respectively. 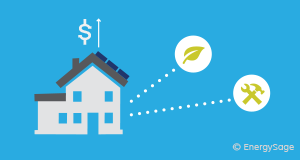 While other popular residential energy efficiency projects do not always have a positive ROI, they can still add a significant proportion of their initial installation cost to your home’s market value. For example, if you invest in upgrades that improve sealing and insulation inside your home, such as new roofing, doors, and siding, you can recover 75 to 83% of the installment costs upon resale. Additionally, replacing antiquated HVAC systems with high efficiency systems can add up to 71% of the initial cost to your home’s overall value. Sealing and insulation improvements can also reduce the cost of replacing your HVAC system by reducing the requisite size of the heating or cooling unit. Overall, although the recoup value of energy efficient upgrades may not always surpass 100% and generate a positive ROI on its own, the savings on utility bills during your time of residency can tip the financial balance in your favor. Studies conducted by the Lawrence Berkeley National Laboratory (LBNL), which is funded by the U.S. Department of Energy, have found that homes with solar consistently sell for more than comparable homes without it. An average 5-kilowatt (kW) solar panel system can add an additional $20,000 or more to your home’s value – and that’s before accounting for the monthly electricity bill savings. 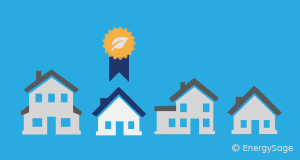 Green certifications awarded to private residencies by institutions such as ENERGY STAR and LEED are another way that implementing energy efficiency upgrades can add value to your home. One study conducted by economists at the University of California, Berkeley and UCLA, found that, in the California real estate market, single-family homes with green labels sold at an average premium of 9% (±5%) compared to similar homes from 2007 to 2012. Even within California, these premiums varied based on the local climate, with hotter, more arid areas fetching higher prices on green homes. The reason for this is simple: it’s more expensive to maintain a comfortable home temperature in harsher environments. Additionally, green homes were likely to sell for more in areas where homeowners were environmentally minded. You can apply for residential green labels from both national and local institutions. To acquire green certifications from national institutions such as ENERGY STAR and Leadership in Energy and Environmental Design (LEED), your home must meet a specific set of criteria regarding overall energy consumption. The first step to meeting these standards is to get a professional home energy audit so that you can identify areas where your home could be more energy efficient. As mentioned above, implementing the necessary measures may have a high initial cost, but can be more than completely offset by utility bill savings and home value appreciation. Depending on where you live, you may also have access to programs that reduce the cost of implementing energy efficiency measures through rebates and tax breaks, or make it easier to finance your project with a low-interest loan. The eligibility requirements and application process for green certifications differ based on the institution. An ENERGY STAR certification requires an ENERGY STAR score over 75 for your home to be eligible, and the application process mainly utilizes the ENERGY STAR Portfolio Manager. The LEED for Homes certification require the home to meet the LEED version 4 (v4) Minimum Program Requirements (MPRs), and is dependent on the LEED Building Design and Construction (BD+C) for Homes and Multifamily Lowrise rating system. While these ratings are frequently used for new homes, you can also get LEED certification for your existing home. Residential energy efficiency is a growing trend in the real estate market, with sellers highlighting the benefits of efficient upgrades in the face of rising energy prices. When it is time to sell your house, you should inform your real estate agent or real estate broker of the energy efficient measures that are now a part of your home’s infrastructure. Renovations such as supplemental insulation and HVAC system overhauls will be passed on to future owners, along with their energy savings. In addition, these upgrades markedly improve habitation comfort within the home and can be a potential selling point. To ensure that your home’s energy efficiency benefits are made clear, make sure to provide relevant documentation that proves the energy efficiency of your home. The easiest way to do this is to include a sample of your monthly utility bill and an energy rating obtained from a home energy audit in the description of your house on a multiple listing service.